Just before you all cry out at why I have classed 'Exercise' and 'Evils' as two different things, I would like to confirm that exercise is still my idea of the epitome of evil, particularly to anyone who spends the majority of their time horizontal. And no, I have not gone crazy or become a gym bunny. Quite simply, I like a little bit of alliteration in my life. At the beginning of January, I wrote my 'New Years Resolution' post. Full of all the generic stuff that I am (surprisingly) keeping to. One of those in particular was the New Year New Me section. A part I didn't particularly elaborate on at the time, not because I am an illusive woman, simply because I find it all a bit personal and all very very very depressing. Moving to a country known for its diabolically beautiful race of humans, I have been anxious to keep up and if anything, increase my motivation to become a super hot version of myself. And so far, the move has actually worked in my favor. For a start, the family I am staying with are on an extreme health kick, despite being absolutely tiny. And due to my new apartment being on the top floor, I have found I spend more time running up and down the stairs than in either flat. So here is a little moan about life itself. Why am I not the kind of person who enjoys the feel of burning muscle and doesn't debate suicide after climbing a never ending staircase? I have a friend who claims to 'love walking up hill'... until I met her, I didn't know these people existed. I quickly defriended her, of course. I mean, if it's got to hurt, couldn't calories scream every time they burned to make it all more worth while and as a slight 'F**k You!' to your body? Apparently, when God created us, he decided we needed pain to stay bangin'. 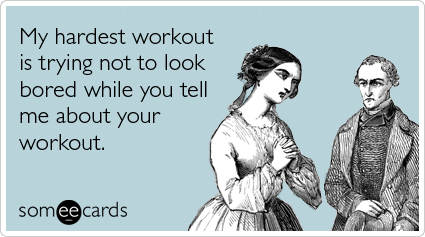 And then, just to make all us normal folk seem worse, there are those people who love working out. The guys and gals who post status after status about gyms and lifting and weights and running and ohmygodwillyoupleasebequiet! It is fantastic that you go to the gym. But let's not make the rest of the world feel bad for watching 1 (or 6) series of Gossip Girl in their spare time instead. Despite my ever-so-little moan about the cruelty of exercise and all healthy foods tasting like cat piss, I do fully intend to stay on my routine to a healthier body. Twice this week I have even risen early and done yoga. On a rug. Via youtube. But yoga none the less. I know eventually my muscles will stop crying out in pain when I exert it past walking to the fridge, and yes one day my taste buds will come accustom to the taste of celery and artichoke, and let's face it, those stairs are going to do a world of good to my bum (as Albina, former owner of this flat, has informed me). But right now, I am in the tragic January stage of my transformation. And I wanted you all to know, whether you are doing the 5:2 diet with the rest of the world, a fad diet to slim down for that event, or you are simply just wanting to change your life style and feel better about yourself. I get it. I understand your pain. And you don't have to fake smiles and enthusiasm at healthy living with me. Whenever you feel down, just remember, the chances of you catching Leonardo Di Caprio's eye are much higher when you fit into 'slim fit' jeans and don't roll back down when you attempt too many stairs.